We’ve moved! After ten years at the Forge, the Garden Requisites showroom has recently moved, not too far and still in Batheaston, into lovely larger premises just across the road. The last ten years have been busy and transformational as Hilary and John, together with a steadily expanding team, have successfully grown our unique British business to what it is today. Garden Requisites has really sprouted wings over the last few years, building on our unique top-quality ranges, employing local people who help to design, craft, manufacture and directly supply our customers. Our super range of stylish metal garden structures and now interiors pieces such as designer fireguards and log holders can be spotted in smart garden schemes and homes, worldwide. Moving into expanded showroom space is the next step in our evolution. Love a new start in the springtime! 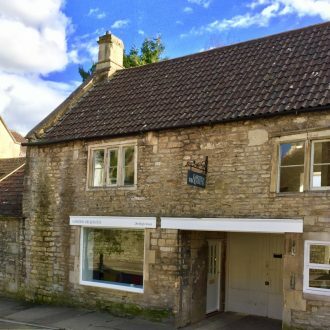 Our showroom and workshop are situated in Batheaston village on what used to be the old A4 trunk road to the East of Bath – London Road, East. The village car park is close by if you’re dropping in to see samples in person and/or have a chat with Hilary & team. Steeped in all ages of English history and surrounded by folding hills told of in old tales, there’s evidence that the Batheaston area has been occupied since Neolithic times. The village was established in the days of the Saxons, reflected in the name elements ‘East Tun’ meaning settlement to the East and was also criss crossed by two Roman roads including the Exeter to Lincoln ‘Fosse Way’. Find out more about our location’s ancient roots in Batheaston Parish Council’s history of the village. Thinking of perfecting your outdoor space? It’s the perfect time to visit our new place. Showroom visitors can see in person how the ranges and shapes sit together, so important when you’re considering a new garden design or layout. If you haven’t been to see us for a while, you might be interested in seeing the new designs developed by John and the workshop team over the last couple of years. These include satisfyingly solidly crafted circular, square and rectangular metal planters & troughs, some with in-built trellis, as well as more contemporary designs of metal garden trellis, door canopies, porches and fireguards and log holders. So, our new address is 286 High Street, Batheaston, BA1 7RA. Tap it in to the sat nav and head in our direction. We hope to see you in person soon!